It was at the Agro Inov Pavillion (Technology Pavillion) that INESC TEC participated for the second time in an initiative aimed at promoting the interactivity between the different agents in the agriculture and forest area, namely through the meeting of farmers and foresters, along with companies and institutions related to the development of technological and scientific means. The participation of INESC TEC was promoted under one of its areas of innovation called TEC4AGRO-FOOD, whose goal is to develop and to promote the research and technology in Agri-Food and Forestry, in order to meet the needs and the expectations of the end users, collaborating with "Technology Holders" capable of “endogenising" technologies and creating innovative products and services. 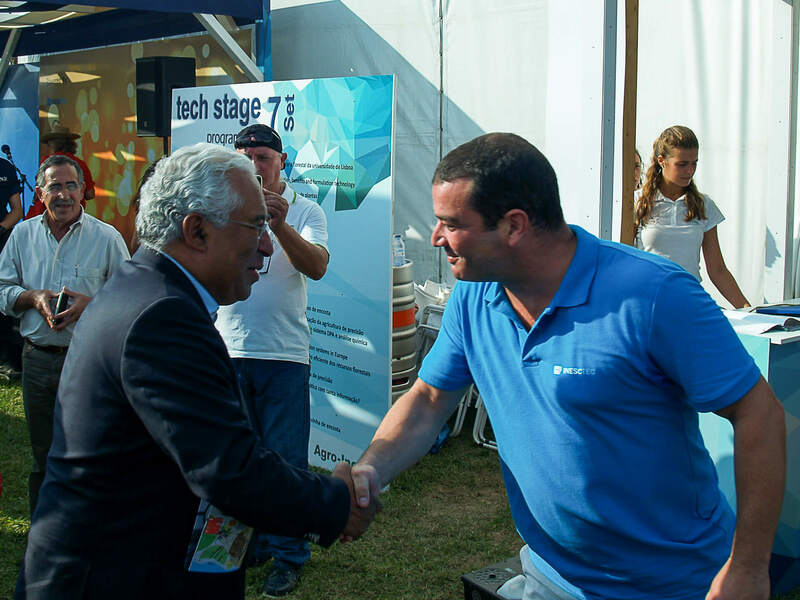 The trade fair had the visit of several figures, particularly the Prime Minister, António Costa, Minister for Agriculture, Luís Capoulas Santos, the Minister for Science, Manuel Heitor, the Secretary of State of Forestry and Rural Development, Miguel João de Freitas, the Secretary of State of Agriculture and Food, Luís Medeiros Vieira, the Director-General of Agriculture and Rural Development of the European Commission, the President of INIAV, Nuno Canada, the “Rector of the Rectors” Fontainhas Fernandes and the CDS-PP party leader and former Minister of Agriculture and Sea, Assunção Cristas, who had the opportunity to understand the work developed at INESC TEC. “There are four main digital technologies in the agenda of the ongoing digital (r)evolution in agriculture and forestry: the Internet of Things; the Artificial Intelligence; the Robotics and the Big Data. INESC TEC has skills, resources and experience in all these areas and has made important advancements in these sectors in the past few years”, explains André Sá, responsible for the TEC4AGRO-FOOD at the Industry Partnership Service (SAPE). 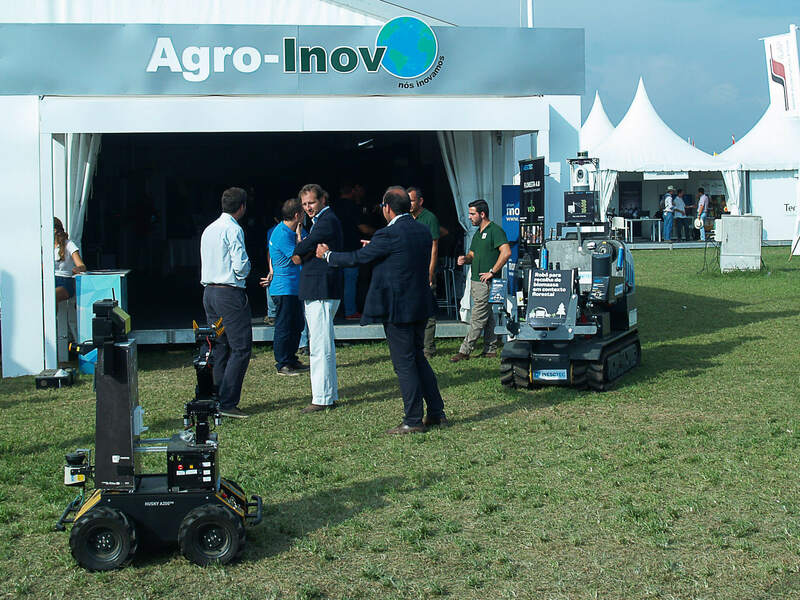 Around 50 000 people visited this edition of the Agroglobal. The dynamic and interactive initiative, which was organised in a “three dimensions” format, brought together the knowledge of farmers and foresters with the technical knowledge of the companies. 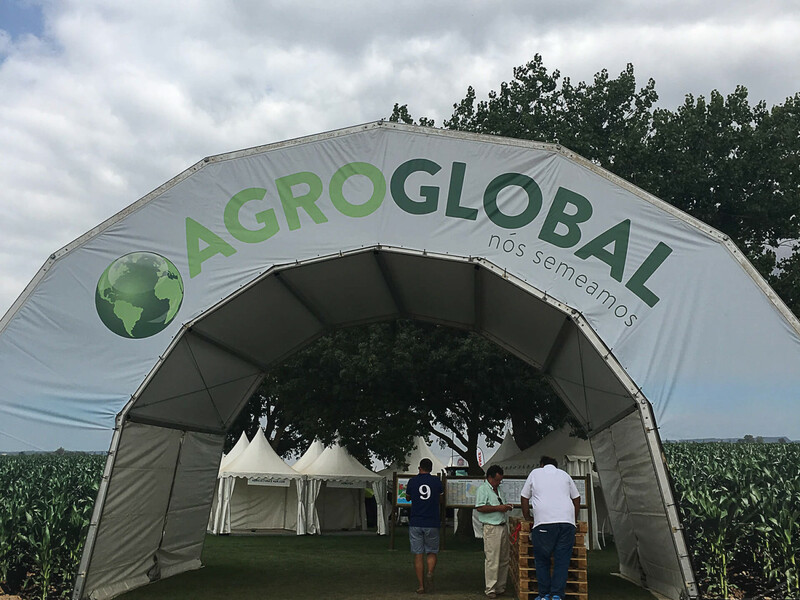 “We sincerely hope that Agroglobal brings many good benefits to all the organisations present here," says Joaquim Pedro Torres, organiser of the Agroglobal, highlighting that "it was the enthusiasm, the commitment and the dynamism of each person that mobilised the organisation and that made us believe that it was possible to build the biggest Agroglobal to date". It was in an area of about 200 hectares of land that more than 100 agricultural and forestry machines were used in the plantations of different cultures, an area of exhibitors with the presence of about 400 entities, parallel to a space dedicated to innovation, with demonstrations of machinery, a kind of Business Center, most suitable for companies and business development, and also the so-called TechStage, in which a program was held with colloquiums and debates and where the technological solutions of INESC TEC were presented in pitch format. 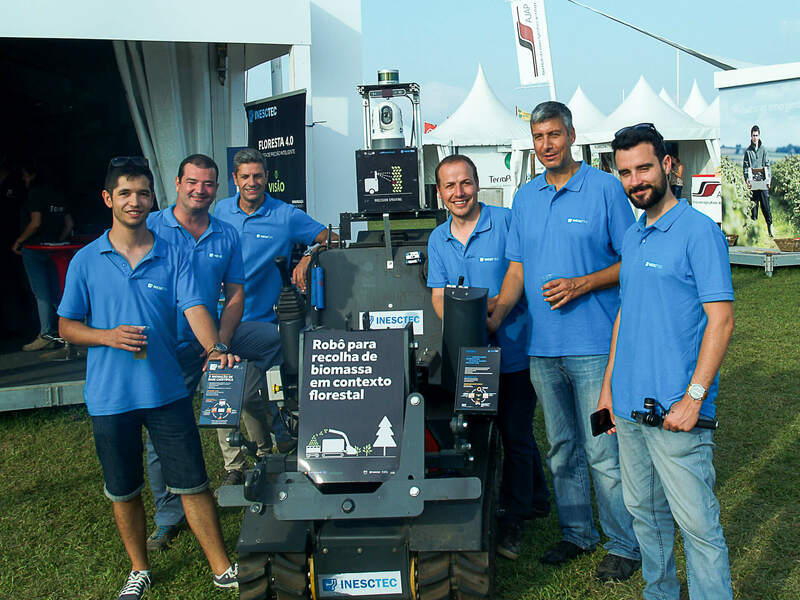 One of the projects of INESC TEC that were exhibited is called BIOTECFOR and consists in the development of a robot, along with a Portuguese Forestry Association and two more Galician entities, that will enable the cleaning of the forest in the north of Portugal and in Galicia, thus reducing the effort of the operators and making these operations safer. The machines developed under this project will operate autonomously, even though they will be supervised by the operators and will be equipped with devices that cut the vegetation of the trees and preprocess it, thus reducing the transport cost to the processing site. As for FOCUS project, it was a European project led by INESC TEC that integrated sensors that monitor the productivity of the operations and the material flow throughout the chain into a comprehensive solution that along with software modules allows to supervise operations in the forest and to withstand the decision making in real time. Therefore, it can minimise the impact of the forestry operations, by reducing the CO2 emission and ensuring a great exploitation of forest resources that although renewable are scarce. RoMoVi is an agricultural robot that monitors hilly terrains such as the hillside vineyards, in a modular form and completely autonomous. This robot arose from the joint work of INESC TEC, TEKEVER and the Association for the Development of Viticulture in the Douro Region (ADVID). Smart Farming, which is more related to the Artificial Intelligence area, has the goal to optimise the agricultural production through an agronomic management tool that simplifies the agricultural processes, determining parameters and tasks related to watering, fertilisation, crops and diseases by improving them. Smart Farming, which is applied to the smart precision agriculture, is being developed by INESC TEC, ProdFarmer, Esporão, Sociedade Agrícola da Herdade Maria da Guarda and the National Institute for Agrarian and Veterinarian Research (INIAV). The Cistern for the smart precision agriculture, which was developed by INESC TEC along with HERCULANO (“Made by HERCULANO powered by INESC TEC”), allows an application at the right time, in the right quantity, in the right place, through a prescription letter, thus making it less wasteful and more effective. The Cistern is composed of a console for multiple agricultural tools, has automatic adjustment of the slurry application depending on the speed and has a sensor for pig and cow slurry, thus satisfying the most demanding European standards. HERCULANO, along with INESC TEC, also had the opportunity to present this new technology in the afternoon of 5 September at a specific place of the fair for that purpose. José Carlos Caldeira (member of INESC TEC’s Board) and Fernando Teixeira (manager of HERCULANO) signed a collaboration protocol on 5 September in the presence of Luís Capoulas Santos. The protocol between the two entities aimed at maintaining the joint development of Research and Innovation (R&I) activities under the Smart Precision Agriculture/Forest context, namely continuing the companies’ line of products entitled “GreenPrecision”. 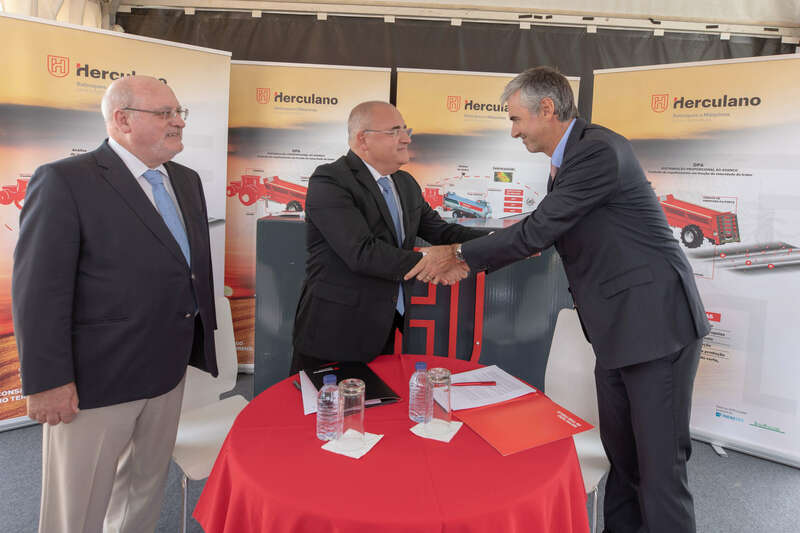 HERCULANO, which creates and markets agricultural semitrailers, agricultural tools, innovative equipment and accessories for agriculture, forest and related areas, has the goal to incorporate digital technologies of a variable rate in its products. The goal is to have the possibility to contribute to the challenges of the global society, related to the food safety and to one sustainable agriculture and forest and to the national economy. According to André Sá, the main goals of the first participation of INESC TEC at the Agroglobal in 2016 were to “present the skills, experience and resources of INESC TEC under the TEC4AGRO-FOOD, to create visibility on the institution in the agri-food and forest sector and to formalise, with support from the Minister for Agriculture, the partnership with INIAV. Those goals were fulfilled”. The main goals of the second participation of INESC TEC at the Agroglobal 2018 were to present technological solutions for the agriculture and forest, to once again formalise, with support of the Minister for Agriculture, the partnership with HERCULANO and to create opportunities for future collaborations, namely with companies. The organisation considers that these goals were also fulfilled. The INESC TEC’s team that ensured this participation is multidisciplinary, showing the cross-sectional work that the TEC4AGRO-FOOD area implies. The event was attended by André Sá and Nuno Campos (Industry Partnership Service), Filipe Santos, Ricardo Reis and Luís Santos (Centre for Robotics in Industry and Intelligent Systems), Lino Oliveira (Centre for Information Systems and Computer Graphics), Jorge Cunha (Centre for Enterprise Systems Engineering), Carlos Ferreira (Laboratory of Artificial Intelligence and Decision Support), Catarina Carvalho (Communication Service), José Carlos Caldeira (Board) and Jorge Santos (Management Information Systems Service). The researchers mentioned in this news piece are associated with INESC TEC and IPP-ISEP.